← Which Type of Listener Are You? The Bible is the most amazing Book ever written. You may not agree with that statement, but before you choose to disagree, let’s look further into why I feel confident making a statement like that. The One who spoke the universe into existence still speaks just as powerfully through the pages of the Bible that you can so easily hold in your hands today. At the moment a person steps over the faith line (chooses to give their life to Jesus), believers receive the Holy Spirit and the lines of communication with God are established. Then, whenever the Scriptures are read, children of God can hear His voice and the Spirit enables them to understand and put into practice what they have read. 13 But we ought always to thank God for you, brothers and sisters loved by the Lord, because God chose you as first fruits to be saved through the sanctifying work of the Spirit and through belief in the truth. The Word of God has the power to change our lives if will believe Him and do what He says. God uses Scripture to transform us from the inside out. His Word has the quality of a sword that cuts through our hearts and judges thoughts and intentions, delivering light to the darkness that so often resides deep in our souls. This Book tells us not only who God is, but also who we are. Sometimes life’s concerns can deafen our “spiritual ears.” Before reading Scripture, it is important to ask God to help you hear and understand what he’s saying. As you believe and obey, your spiritual hearing will become more acute and your time in the Word will be a more intimate conversation with God. 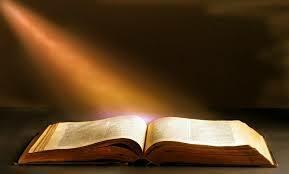 Today I would like to challenge us all to try to carve out a small part of our day to spend reading this great Book. In addition, try to find at least one thing from what you read each day to work on in your own life. This practice will transform our lives a little bit each day. Over a lifetime, the transformation will be so immense, we will find that we are completely different and so much better. Now tell me another book you can think of that will do that? It really is the most amazing Book ever written! This entry was posted in Attitude, Bible, Change, Communication, Decisions, God, Holy Spirit, Inspirational, Jesus, Reinventing Yourself, Relationships, Salvation, Time, Worship and tagged 2 Peter 1:20-21, 2 Thessalonians 2:13, active, alive, amazing, believe, Bible, Book, change, comforting, communication, darkness, existence, faith line, God, hearts, Hebrews 4:12-13, Holy Spirit, intentions, Isaiah 55:10-11, Jesus, life-changing, light, power, read, Scriptures, speaks, statement, transform, Truth, understanding, universe, verses. Bookmark the permalink.